Update (Feb 3, 06): Apparently, Sony's doing the same to promote its PSP, although people aren't excited. Adam Green over at Darwinian Web has kindly said of Adlab: "I never know what to expect when a new post from this unique blog appears in my RSS reader." Let me tell you, I never know what will come up in your RSS reader next, and when I find out, I'm just as surprised. Say, how many times have been to bar where they stamp your hand at the door? Now look at this. 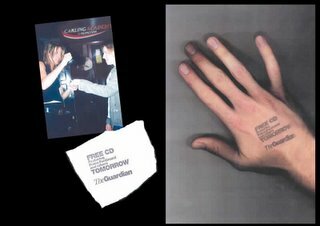 "Door staff at clubs and nightclubs across the United Kingdom used these specially designed stamps on Friday night. (Usually, they're used as proof that you've paid to enter the club.) The person would then wake up on Saturday morning and be reminded of the free CD offer in Saturday morning's Guardian newspaper." An Epica finalist for media innovation. Hats off to the sheer brilliance.